I'm always looking for ways to repurpose things rather than toss em in the trash. It keeps things from landfills and gives us the freedom of having more money, since we have to buy less. Anyway I really like to repurpose baby food jars and containers since, after two little ones, we've gone through so many. One of the handiest things I've come up with, is using them to hold small portions of snacks for my kids. Once they each started eating solids, I would fill up the empty baby food jars with the Gerber Puffs or Cheerios or other small baby snacks. Then when we're going out anywhere where they might need a snack, I can just grab one of the jars and toss it in my purse. Works for me! Another way I repurpose some of the jars is by using them to hold office supplies like push pins, rubber bands and paper clips. Oh, and I've also used the baby food jars for holding small craft supplies. Great for holding little things like wiggly eyes, buttons, glitter, beads and eyelets. 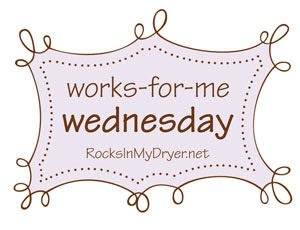 For more handy tips, check out Works For Me Wednesday over at Rocks in My Dryer. Oh, now I wish I'd saved some baby food jars! Gotta love those baby food jars...what a green way to organize! Awesome! I have a baby new to solids and an accumulating collection of empty jars. I love the craft collection idea and am totally stealing it for my craft closet reorganization! This is a wonderful idea! I've been on a quest for babyfood jars for a couple of projects I want to do, but I don't know anyone who uses babyfood from jars here! I use them to put bath products that I make in. One of my employees brings me all of his empties to use! Hello. I just stumbled upon your blog. We don't have any kids yet, but when we do, I'll be repurposing the baby food jars. I can think of so many possiblities. Thanks for the great ideas! I'm going to go take a look around the rest of your site.